This article is about the county in England. For other uses, see Essex (disambiguation). Motto: "Many Minds, One Heart"
Essex (/ˈɛsɪks/) is a county in the south-east of England, north-east of London. 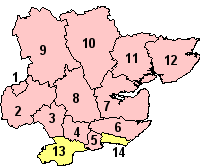 One of the home counties, it borders Suffolk and Cambridgeshire to the north, Hertfordshire to the west, Kent across the estuary of the River Thames to the south, and London to the south-west. The county town is Chelmsford, the only city in the county. For government statistical purposes Essex is placed in the East of England region. Essex occupies the eastern part of the ancient Kingdom of Essex, which united with the other Anglian and Saxon kingdoms to make England a single nation state. As well as rural areas, the county also includes London Stansted Airport, the new towns of Basildon and Harlow, Lakeside Shopping Centre, the port of Tilbury and the borough of Southend-on-Sea. Colchester in the north-east of the county is Britain's oldest recorded town, dating from before the Roman conquest, when it was known as Camulodunum and was sufficiently well-developed to have its own mint. In AD 824, following the Battle of Ellandun, the kingdoms of the East Saxons, the South Saxons and the Jutes of Kent were absorbed into the kingdom of the West Saxons, uniting Saxland under King Alfred's grandfather Ecgberht. Before the Norman conquest the East Saxons were subsumed into the Kingdom of England. After the Norman conquest, Essex became a county. The pattern of settlement in the county is diverse. The Metropolitan Green Belt has effectively prevented the further sprawl of London into the county, although it contains the new towns of Basildon and Harlow, originally developed to resettle Londoners after the destruction of London housing in the Second World War, since which they have been significantly developed and expanded. Epping Forest also prevents the further spread of the Greater London Urban Area. As it is not far from London with its economic magnetism, many of Essex's settlements, particularly those near or within short driving distance of railway stations, function as dormitory towns or villages where London workers raise their families. Part of the southeast of the county, already containing the major population centres of Basildon, Southend and Thurrock, is within the Thames Gateway and designated for further development. Parts of the southwest of the county, such as Buckhurst Hill and Chigwell, are contiguous with Greater London neighbourhoods and therefore form part of the Greater London Urban Area. A small part of the southwest of the county (Sewardstone) is the only settlement outside Greater London to be covered by a postcode district of the London post town (E4). With the exception of major towns such as Colchester, Chelmsford and Southend-on-Sea, the county is rural, with many small towns, villages and hamlets largely built in the traditional materials of timber and brick, with clay tile or thatched roofs. Other businesses in the county are dominated by mechanical engineering, including but not limited to metalworking, glassmaking and plastics and the service sector. Colchester is a garrison town, and the local economy is helped by the Army's personnel living there. Basildon is the location of State Street Corporation's United Kingdom HQ International Financial Data Services, and remains heavily dependent on London for employment, due to its proximity and direct transport routes. Southend-on-Sea is home to the Adventure Island theme park and is one of the few still growing British seaside resorts, benefiting from direct, modern rail links from Fenchurch Street railway station and Liverpool Street station (so that housing is in high demand, especially for financial services commuters), which maintains the town's commercial and general economy. Parts of eastern Essex suffer from high levels of deprivation; one of the most highly deprived wards is in the seaside town of Clacton.[timeframe?] In the Indices of deprivation 2007, Jaywick was identified as the most deprived Lower Super Output Area in Southern England. Unemployment was estimated at 44% and many homes were found to lack very basic amenities. The Brooklands and Grasslands area of Jaywick was found to be the third-most deprived area in England; two areas in Liverpool and Manchester were rated more deprived. In contrast, west and south-west Essex is one of the most affluent parts of eastern England, forming part of the London commuter belt. There is a large middle class here, and the area is widely known for its private schools. In 2008, The Daily Telegraph found Ingatestone and Brentwood to be the 14th- and 19th-richest towns in the UK respectively. Essex is a strongly Conservative county, and 15 of its 18 constituency MPs had absolute majorities (over 50%) in the 2017 UK general election. Though all 18 MPs in Essex are currently Conservative, there have previously been some Labour MPs: most recently, Thurrock, Harlow and Basildon in Labour's 2005 election victory. The Liberal Democrats until 2015 had a sizeable following in Essex, gaining Colchester in the 1997 general election. The 2015 general election saw a large vote in Essex for the UK Independence Party (UKIP), with its only MP, Douglas Carswell, retaining the seat of Clacton that he had won in a 2014 by-election, and other strong performances, notably in Thurrock and Castle Point. But in the 2017 general election, UKIP's vote share plummeted by 15.6% while both Conservative and Labour vote shares rose by 9%. This resulted in Labour regaining second place in Essex, increasing their vote share across the county and cutting some Conservative majorities in areas which had been unaffected by the 1997 general election, namely Rochford and Southend East and Southend West. The most Conservative seat by vote share is Saffron Walden with almost 62% voting Conservative. In contrast, Thurrock is the most marginal seat. In 2015, Thurrock epitomised a three-party race with UKIP, Labour and the Conservatives gaining 30%, 31% and 32% respectively. In 2017, the Conservatives held Thurrock with an increased share of the vote, but a smaller margin of victory. It was the constituency in which UKIP performed best in 2017, with 20% of the vote while all other areas had been reduced to low single figure vote shares. Several new MPs were elected in the 2017 election, with Alex Burghart, Vicky Ford, Giles Watling and Kemi Badenoch all replacing senior Conservative politicians such as Sir Eric Pickles, Sir Simon Burns, Douglas Carswell and Sir Alan Haselhurst, respectively. At the 2013 County Council elections the Conservative Party retained overall control of the council, but its majority fell from twenty-two to four councillors. UKIP, Labour and the Liberal Democrats each won nine seats. Out of those three parties, UKIP gained the largest share of the county-wide vote, more than 10% ahead of Labour. The Liberal Democrats remain as the official Opposition, despite winning fewer votes. The Green Party gained two seats on the Council, despite its overall share of the vote falling. The Independent Loughton Residents Association and the Canvey Island Independent Party both returned one member and an Independent candidate was also elected. The 2017 County Council elections saw a county-wide wipeout of UKIP. The Conservative Party profited most from this loss, regaining many of the seats it had lost at the previous election. Labour, despite a slight rise in its share of the vote, had fewer councillors elected. The Liberal Democrats also saw a notable revival, but were unable to translate this into seats. The Conservatives retained firm control of the council. The next election will be in 2021. The main airport in Essex is London Stansted Airport, serving destinations in Europe, North Africa and Asia. The Conservative-Liberal Democrat coalition government formed in May 2010 agreed not to allow a further runway until a set time period,[when?] so curtailing the operator's ambitions for expansion. London Southend Airport, once one of Britain's busiest airports, opened a new runway extension, terminal building and railway station in March 2012. It has a station on the Shenfield to Southend Line, with a direct link to London. East of the Dartford Road Crossing to Dartford, Kent, across the Thames Estuary, a pedestrian ferry to Gravesend, Kent operates from Tilbury during limited daily hours, and there are pedestrian ferries across some of Essex's rivers and estuaries in spring and summer. The M25 and M11 motorways both cross the county in the extreme south and west, enabling regular commuting between parts of the county and Kent, Hertfordshire and Cambridge. The A127 and A13 trunk roads are important radial routes connecting London and the M25 to the south of Essex. The A12 runs across the county from south west to north east and carries traffic not just within Essex but also between London and Suffolk, east Norfolk and the ports of Felixstowe and Harwich. The West Anglia Main Line from Liverpool Street to Stansted Airport and onward to Cambridgeshire. The county's coat of arms comprises three Saxon seax knives (although they look rather more like scimitars), mainly white and pointing to the right (from the point of view of the observer), arranged vertically one above another on a red background (Gules three Seaxes fessewise in pale Argent pomels and hilts Or points to the sinister and cutting edges upwards); the three-seax device is also used as the official logo of Essex County Council; this was granted in 1932. The emblem was attributed to Anglo-Saxon Essex in Early Modern historiography. The earliest reference to the arms of the East Saxon kings was by Richard Verstegan, the author of A Restitution of Decayed Intelligence (Antwerp, 1605), claiming that "Erkenwyne king of the East-Saxons did beare for his armes, three [seaxes] argent, in a field gules". There is no earlier evidence substantiating Verstegan's claim, which is an anachronism for the Anglo-Saxon period seeing that heraldry only evolved in the 12th century, well after the Norman Conquest. John Speed in his Historie of Great Britaine (1611) follows Verstegan in his descriptions of the arms of Erkenwyne, but he qualifies the statement by adding "as some or our heralds have emblazed". 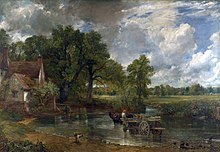 The Hay Wain by John Constable shows the Essex landscape on the right bank. Essex is also home to the Dunmow Flitch Trials, a traditional ceremony that takes place every four years and consists of a test of a married couple's devotion to one another. A common claim of the origin of the Dunmow Flitch dates back to 1104 and the Augustinian priory of Little Dunmow, founded by Lady Juga Baynard. Lord of the Manor Reginald Fitzwalter and his wife dressed themselves as humble folk and begged blessing of the Prior a year and a day after marriage. The prior, impressed by their devotion, bestowed upon them a flitch of bacon. Upon revealing his true identity, Fitzwalter gave his land to the priory on condition that a flitch should be awarded to any couple who could claim they were similarly devoted. By the 14th century, the Dunmow Flitch Trials appear to have achieved a significant reputation outside the local area. The author William Langland, who lived on the Welsh borders, mentions it in his 1362 book The Vision of Piers Plowman in a manner that implies general knowledge of the custom among his readers. Essex is home to two English Football League teams: Southend United and Colchester United. Both teams have reached as high as the Championship (the second tier of English football) at some point in their history. As of 2018-19 Southend United are in League One, while Colchester United are in League Two. Braintree Town are the next highest-placed team, playing in the National League, followed by Chelmsford City, Concord Rangers and East Thurrock United, who play in the National League South. The highest domestic trophy for non-league teams, the FA Trophy, has been won on four occasions by Essex teams; most recently by Grays Athletic in 2006. Essex County Cricket Club became a First-Class County in 1894. The county has won 7 County Championship league titles; 6 of these were won during the dominant period between 1979 and 1992, with a gap of 25 years before the county's next title in 2017. The County is also home to the Chelmsford Chieftains ice hockey team and the Essex Leopards basketball team. It has previously been home to the Essex Eels rugby league team, as well as the Essex Pirates basketball team. Former speedway teams in the county (now no longer operating) include the Lakeside Hammers (formerly Arena Essex Hammers), the Rayleigh Rockets and the Romford Bombers. During the 2012 London Olympics, Hadleigh Farm played host to the mountain bike races. Essex has one horse racing venue, Chelmsford City Racecourse at Great Leighs, and horse racing also took place at Chelmsford Racecourse in Galleywood until 1935. The county has one current greyhound racing track, Harlow Stadium. Rayleigh Weir Stadium and Southend Stadium are former greyhound venues. Team Essex Volleyball Club is Chelmsford's national league volleyball club. It has four teams which play in Volleyball England's national volleyball league. Its Men's 1st team currently competes in the top division in the country, the Super 8s while the Women's 1st team competes one tier below the men. The club has a strong junior program and trains in The Boswells School in Chelmsford. Many famous sports stars have come from or trained in Essex. These have included swimmer Mark Foster; cricket stars Trevor Bailey, Nasser Hussain, Alastair Cook and Graham Gooch; footballers Peter Taylor, James Tomkins, Justin Edinburgh, Nigel Spink; tennis stars John Lloyd and David Lloyd; Olympic Gold-winning gymnast Max Whitlock; Olympic sailing champion Saskia Clark; World Champion snooker stars Stuart Bingham and Steve Davis; world champion boxers Terry Marsh, Nigel Benn and Frank Bruno; London Marathon winner Eamonn Martin; international rugby players Malcolm O'Kelly and Stuart Barnes; Formula 1 sports car drivers Johnny Herbert and Perry McCarthy. Mistley Towers, Manningtree, between Colchester and Ipswich, near Alton Water. ^ "The High Sheriff of Essex 2019-20". worldpress.com. Retrieved 16 April 2019. ^ "Did you know deprivation in Chelmsford Diocese". Archived from the original on 8 March 2012. Retrieved 4 February 2016. ^ "Jackwich: Village 'third most deprived area in UK'". Archived from the original on 9 October 2011. Retrieved 4 February 2016. ^ "Britain's richest towns: 20 – 11". The Daily Telegraph. London. 18 April 2008. Archived from the original on 3 February 2014. ^ "Recap: EU referendum 2016 Essex reaction to historic Brexit vote". Essex Live. 23 June 2016. Retrieved 14 February 2017. ^ a b c "Local government structure". www.essex.gov.uk. Archived from the original on 23 August 2016. Retrieved 14 February 2017. ^ "About us". www.young-essex-assembly.org.uk. Archived from the original on 15 February 2017. Retrieved 14 February 2017. ^ Warr, Mike. "Youth Council". www.eppingforestdc.gov.uk. Archived from the original on 15 February 2017. Retrieved 14 February 2017. ^ R4U (14 December 2016). "Residents for Uttlesford [R4U] | R4U's Uttlesford Youth Council initiative gets green light". Residents for Uttlesford. Retrieved 14 February 2017. ^ "Youth Council | Harlow Council". www.harlow.gov.uk. Archived from the original on 11 February 2017. Retrieved 14 February 2017. ^ Cheap flights from London Stansted to Sharm El Sheikh Archived 27 June 2014 at the Wayback Machine. easyJet.com (17 February 2013). Retrieved on 17 July 2013. ^ Topham, Gwyn (5 March 2012). "London Southend airport: flying under the radar (and to the left of the pier)". The Guardian. London. Archived from the original on 3 April 2015. Retrieved 5 March 2012. ^ "DFDS Harwich to Esbjerg ferry route's final journey - BBC News". Bbc.co.uk. Archived from the original on 30 November 2017. Retrieved 16 September 2017. ^ "London Gateway : Home". www.londongateway.com. Archived from the original on 13 June 2016. Retrieved 18 June 2016. ^ Portswatch: Current Port Proposals: London Gateway (Shell Haven) Archived 25 July 2008 at the Wayback Machine. Retrieved 15 April 2009. ^ Thurrock Council. (26 February 2003). Shell Haven public inquiry opens Archived 15 September 2013 at the Wayback Machine. Retrieved 15 April 2009. ^ Dredging News Online. (18 May 2008). Harbour Development, Shell Haven, UK Archived 3 January 2009 at the Wayback Machine. Retrieved 15 April 2009. ^ "OS Maps - online and App mapping system | Ordnance Survey Shop". getamap.ordnancesurvey.co.uk. Archived from the original on 29 October 2013. Retrieved 18 June 2016. ^ "National Rail Enquiries - Official source for UK train times and timetables". www.nationalrail.co.uk. Archived from the original on 25 February 2011. Retrieved 18 June 2016. ^ Essex County Council. (2006). Secondary School Information Archived 7 September 2008 at the Wayback Machine. Retrieved 15 April 2009. ^ independent schools Directory. (2009). Independent Schools in Essex Archived 30 October 2012 at the Wayback Machine. Retrieved 15 April 2009. ^ a b Robert Young. (2009). Civic Heraldry of England and Wales. Essex Archived 3 February 2007 at the Wayback Machine. Retrieved 16 April 2009. ^ "Dunmow Flitch Trials - History - Background". www.dunmowflitchtrials.co.uk. Archived from the original on 9 June 2016. Retrieved 18 June 2016. ^ Bettley, James. (2008). Essex Explored: Essex Architecture. Essex County Council. Retrieved 15 April 2009. ^ "Colchester Castle Museum-Index". Colchestermuseums.org.uk. Archived from the original on 12 April 2010. Retrieved 23 April 2010. Wikimedia Commons has media related to Essex. Wikivoyage has a travel guide for Essex (England).